Berth Information: The daily visitor fee is doubled and is now JPY 2,100.
this time I tried a short cut closer to the right side and was almost on the rocks. You should proceed into the back of the bay a little bit to 34 20.0 N 136 40.8 E.
to open the route to the entrance without pearl farm rafts under which nets are hanging down in the water. Then proceed straight to the entrance. I put my boat at an open space of the pontoon. a young staff said “you may check in there” pointing a building down the slope. I saw the top of the slope and found no building which was a beautiful club house. President of the club, told me that the house had been burned down by an electric fire. you should understand that the YH entrance will be changed sometimes. The number of the pearl farm rafts is going down though. You should see Suzume-jima Island at your left, not right, when you come in. Once you find a wide open space, you won’t see any problem. 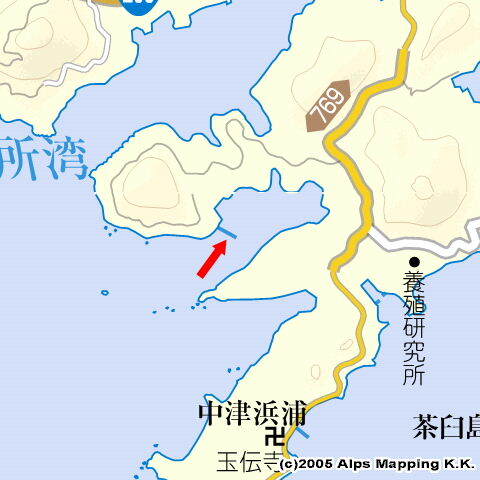 to Oshima light house 34 18.300N　136 40.300E at a little bit inside of the bay entrance. Then, passing by the light house at your left in the west, change the course to Mahana-jima light house. which was written in Professor Nomoto’s book “Cruising Kumano-nada”. But, it was hard to recognize. This time in 2007, I was passing by Suzume-jima at my left and proceeding through the pearl farm rafts. Much of the bay water area is filled with the rafts. You should watch them and carefully move through narrow routes. If you call Shima YH beforehand, they will reserve a berth for you. Then, they will help your mooring at the pontoon. When I came here on Nov 2, 2007, the north wind was strong a little bit. I thought the wind would be down inside the bay though, the wind and the wave were stronger. The bay looked a passage of the north wind geographically. 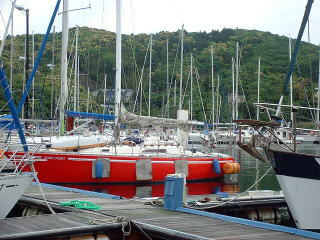 While the wind was strong until the entrance of Shima YH, I was surprised at the calm water inside Shima YH. The north wind is blocked. Here is a native well-sheltered harbor. I felt the wonder of nature. It is said that no rope is required here for mooring. Both the facility and the staff of the harbor are excellent. With reasonable fees, here is a wonderful harbor. In 2007, I was walking to Gokasho-ura town for half an hour. It was closer than I thought. In 2009, I was riding a bicycle. It took just 15 minutes though, it was hard to ride thorough the slope up and down. Once you go out to the road to Gokasho-ura, you will find a big supermarket with variety of goods. I recommend a nature-oriented Restaurant “FIVE” in Gokasho-ura town, which has delicious foods with reasonable prices and comfortable spacious rooms. You may buy honey, organic lemons and oranges. But, when I visited the restaurant again in May 2009, I didn’t feel good than before. Here is no residential house, well sheltered with beautiful green mountains in three directions. The landscape and scenery is amazing. As here is the innermost of the bay and well sheltered, the water is still. Fuel, Power and Water are available. A western style toilet with bidet is good ! A wash machine available for JPY200 and a drying machine for JPY100 were helpful for me. Separating the garbage, you may take out them. It was also helpful. 24hr hot water showers without bath. The public transportation accessibility is no good. It will take half an hour to the nearby bus stand. The YH staff might drive you there. You might use their luggage car.